A new Congressional report says the Littoral Combat Ship is not suited for operations in the 7th Fleet. 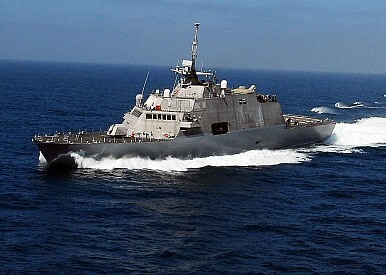 The Littoral Combat Ship (LCS) is unfit for the Pacific theater, according to a congressional watchdog group. Last week, Bloomberg news reported that a U.S. Government Accountability Office report has concluded the LCS would be unsuitable for the U.S. Pacific fleet. “Several 7th Fleet officials told us they thought the LCS in general might be better suited to operations” in the Persian Gulf, the report said, according to Bloomberg. Bloomberg went on to summarize the GAO report as saying that the vessels may lack the necessary “speed, range and electronic-warfare capabilities” to operate in the expansive Pacific, although the LCS would still be fit for use in the much smaller Persian Gulf. At the same press conference, Hagel announced that the Navy was putting the LCS under review. Instead of procuring 52 vessels, as originally planned, Hagel announced that “no new contract negotiations beyond 32 ships will go forward.” He later explained that the Pentagon and the Navy would explore potential alternatives to the LCS before purchasing any more of the vessels. The new GAO report is already being used as fodder by congressional critics of the LCS. For example, in a lengthy floor speech blasting the LCS, Senator John McCain (R-AZ)—a longtime critic of the LCS—noted that: “a soon-to be released GAO report will validate the need for LCS to be subject to rigorous testing and evaluation – not just anecdotal lessons learned from a single overseas deployment. And, there is talk of another impending GAO report critical of LCS that will also likely echo the issues I have long cited that continue to plague this program.” During the speech, McCain urged the Pentagon to further reduce the number of LCS it purchases from 32 to 24. In one potential bright spot for the LCS program, one of its strongest defenders is likely to be the next Deputy Secretary of Defense. Robert Work, the former Under Secretary of the Navy and current CEO of the Center for a New American Security (CNAS), has been nominated by President Obama as the Pentagon’s number two. Late last month, the Senate Armed Services Committee approved his nomination, which must now be voted on by the full Senate. Work has long been one of the biggest proponents of the LCS program, and published a lengthy history and defense of it with the Naval War College early last year.